SADRC runners at the Manchester Marathon. 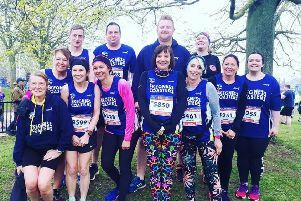 Skegness and District Running Club members were out in force at the Manchester Marathon, where Will Kelly qualified for a championship place at next year’s London event. He clocked an incredible time of 2:41.46, an impressive 27.08 personal best. Robin Harrison, left, at the Manchester Marathon. Leanne Rickett finished as SADRC’s first lady in a fantastic time of 3:37.31, knocking 11 minutes off her PB, which she has held for six years. Helen Luff was next across the line in 4:16.02, an 11-minute PB for the course. Charmane Holgate ran her first marathon in 4:17.17 while Charlie Luff crossed the line in 4:20.53, followed by Michael Bruce (4:22.23). Robin Harrison finished in 4:32.33 and still has a few marathons left to go to finish his epic journey of running 525 days continuously for the Lincs & Notts Air Ambulance, with a minumum of 5k per day. Guy Hatton ran his 43rd marathon, just one week after conpleting number 42, finishing in a time of 4:37.58. More than 30 club members took on the Lincoln 10k at the weekend. Paul Jackson was the first club member home in 35.27, followed by Chris Bertains (38.23 PB) and Ed Crawford (38.29 PB). Mark Lyon finally ran a sub-40 minute 10k, clocking (39.20 PB). Other results: Martin Chapman (42.13 PB), Andy Shelton (42.27), Lauren Raywood (48.36 PB), Dave Kenyon (48.58 PB), Shawn Thomas (49.22 PB), Miranda Hill (53.09 PB), Rob Ster (57.31 PB), Sarah Thomas (55.59 PB), Wayne Waite (56.16 PB), Jenny Waite (1:22.37 PB), Carol Harrison (1:02.21 PB), Natasha Haynes (1:02.15 PB), Mark Haynes (47.22 PB), Luke Haynes (44.40 PB), Darren Weston (40.32), Chris Hurst (47.26), Emily Gelder (50.05), Hilary Speller (56.05), Heather Freeman (59.52). The Paddock Half Marathon is a fast, flat and accurate course on roads through the hop gardens and orchards of Kent. Ian Kocko travelled to Kent to run this race with a friend. He finished in a great time of 1:40.10.